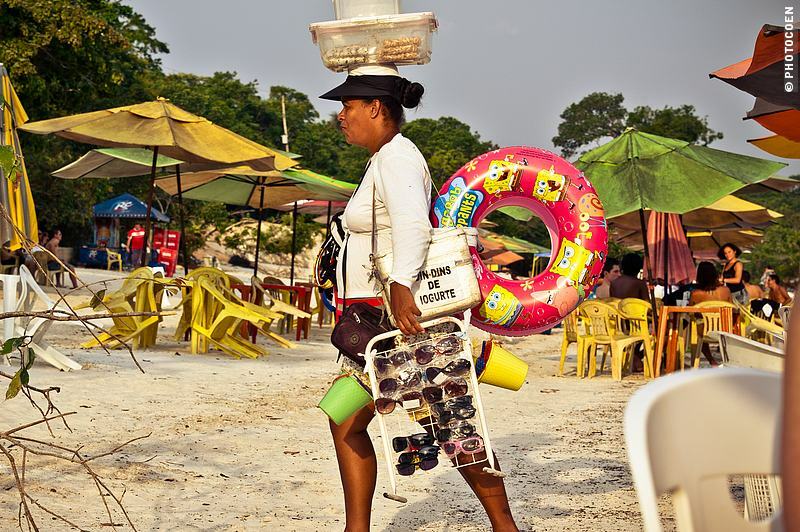 Vendor at Praia da Lua, a popular beach near Manaus. We arrived in Manaus with a list of places I wanted to visit, but Providence ruled differently. In the past I might have had a fit. I had made a list, damn it, and we were going to stick to it. We had to visit these places. After all, wasn’t that what Manaus was about? The rubber boom, historic buildings, the Amazon Theater, parks with wildlife among which an endemic monkey, the Meeting of the Waters, the surrounding Amazon rainforest and indigenous villages? Coen and I are culture buffs. We love visiting museums, buildings, churches and such. But sometimes that’s just not in the grand scheme of things. 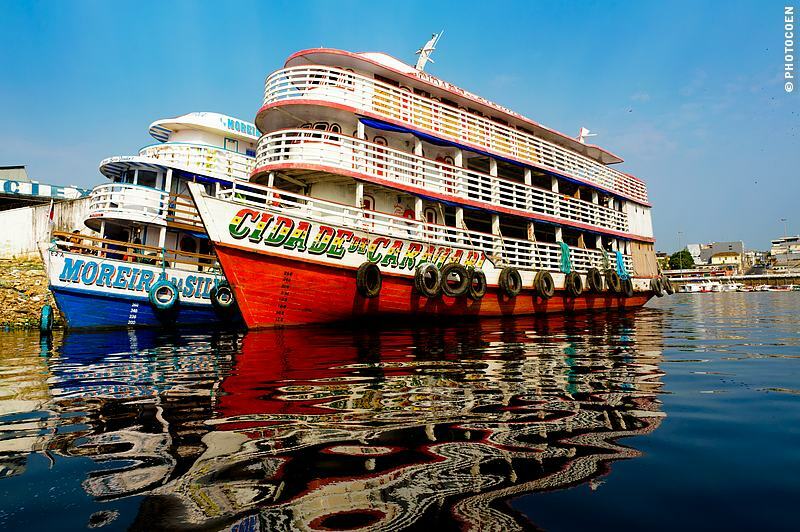 For whatever reason other things happen and we have often experienced that once we go with that flow and let a place – in this case Manaus – unfold as it wants to, we will leave it with a smile on our face. First of all, there was considerable car trouble. 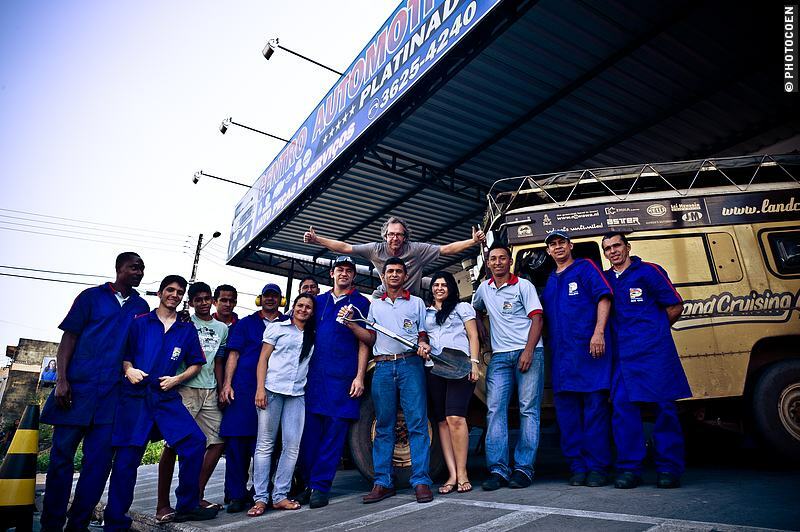 For more than a week Coen labored in Luis Platinado’s workshop to get our Land Cruiser fixed, while doing his share in helping the mechanics with their work as well. He lunched with them at the churrascaria next door and a mechanic took him to the new bridge over the Amazon to capture it on camera at night. He made friends, and got the car fixed. Meanwhile I stayed at our Couchsurfer’s home. We had been invited by Ricardo, who shares a home with six other medics who spend a year or longer in Manaus with the Navy to give medical assistance to river communities and indigenous people in areas that can’t be reached by road. They are an educated, fun-going bunch of people and we daily sat around the table discussing our lives, Brazil’s politics and economy, and problems concerning the destruction of the Amazon Forest and Brazil’s policy on Indigenous Reservations. I made friends and learned a lot about problems and challenges with regard to the Amazon from people who live and work there. One afternoon I took out my list and considered the importance of each item. How many indigenous museums had I already visited in Brazil? Did I honestly need to see this one? How much Amazon flora and fauna had I already seen during our 1,5 years of travel in this country? Were Manaus’ parks actually going to add anything to that? Amazon Boats that serve as local buses. 1. Visit the rubber plantation annex museum. Our host Ricardo joined us and the day not only became a captivating lesson in history but more. On our way back Ricardo suggested stopping at Praia da Lua – a place we normally would have skipped as we don’t care much for beaches. Most Brazilians, by contrast, love to hang out on beaches, swimming and drinking beer until the sun goes down. You can’t go more local and it’s quite an experience. We had fun. 2. 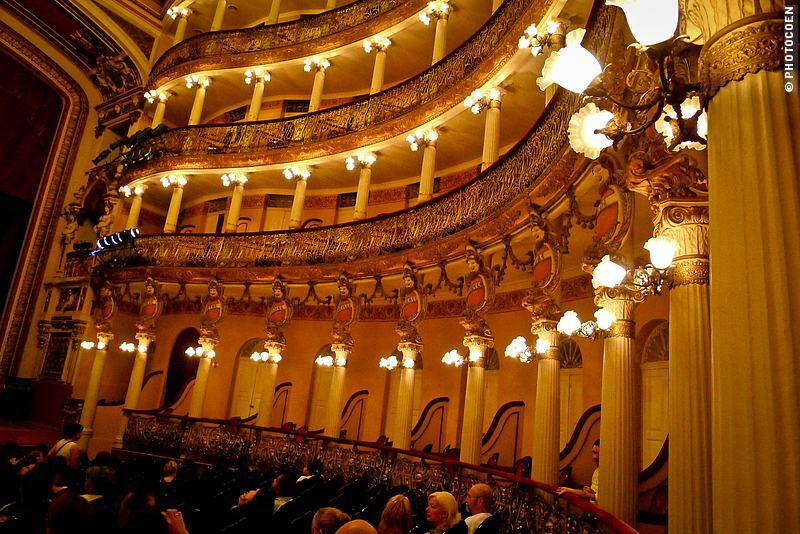 See a show in the Teatro Amazonas, the theater that around 1900 gained world fame for its acoustics and which attracted renowned artists from all over the world to perform there. I went with two friends from the house and another Couchsurfer who happened to be staying there. Unfortunately, the Big Band performance was more of an “Okay, I have seen it” experience than anything else, but this was a night out and my Manaus friends had plans. We started at a local bar (plastic chairs and tables along a street fuming with traffic-jammed cars) with a beer (a bottle, which you share) and fried bacalhau snacks – the best in Manaus, they said. Afterwards they took us to a rodizio pizzeria, which means you pay a fixed price per person and a waiter will come to your table regularly to present different kinds of pizza and pasta from which you can take your pick. Have you ever had pizza with brigadeiro (like chocolate sprinkles) or with cream, banana and cacao? I hadn’t and I had a new favorite to add to my pizza list. 3. Seeing the Encontro das Aguas (Meeting of Waters), the official start of the Amazon where the white-water Solimões River meets the black-water Rio Preto. I had seen a Meeting of the Waters in the state of Rondônia once, and it’s quite a sight. I wanted to see another. #1 and #2 were engaging sights and I’m glad I did both, but having visited them with locals unquestionably added to the experience, because of good company and I got to enjoy activities that are an integral part of Brazilian life. We skipped #3. It was time to leave. I am not a city person. After a week I’m generally done with a city whether it’s because of the heat, the chaos, the noise, the number of people, or a combination of all of those. By then I no longer care about a list, I just want to leave. Even when that lists consists of only three items. Having stayed in Manaus for two weeks was exceptional (a result of the car troubles), and the reason it hadn’t bothered me was largely because we stayed in a residential area, comfortably with our Couchsurfing hosts. But when it does hit me, Coen knows there’s no use arguing. “We’re leaving,” and that’s that. Too bad about the Meeting of the Waters. Little did we know that when we crossed the Amazon River south, our ferry plied over that Meeting of the Waters, so we did get to see it after all. Not with a guided tour in some expensive little boat, but on a local ferry. 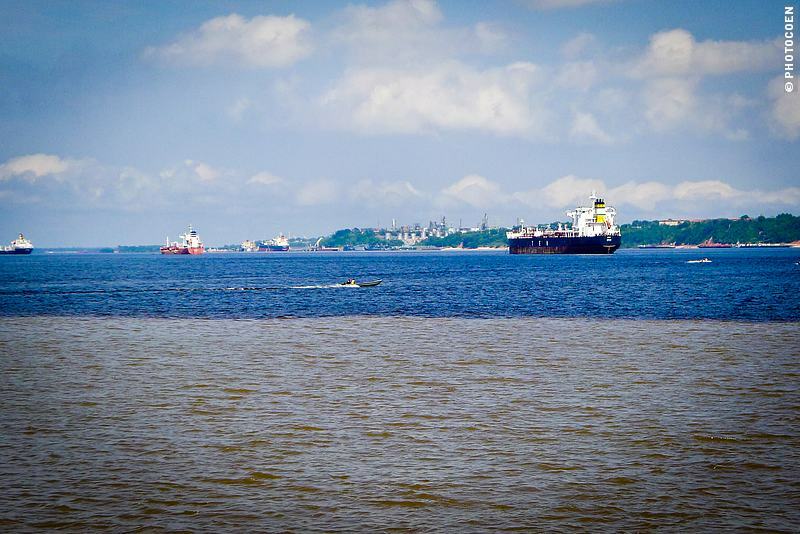 The white-water Solimões meets the black-water Rio Preto: the start of the Amazon River. As I stood upstairs in the passenger’s room and leaned against the open window, a guy next to me started playing his guitar and with a companion sang a beautiful gospel duet as we crossed from black into white water, turning it almost into a spiritual experience. Do you have a list with sites to visit when you arrive in a city? Or do you just arrive, find accommodation and take it from there? This entry was posted in Brazil Travel, Slow Travel by Karin-Marijke Vis. Bookmark the permalink.